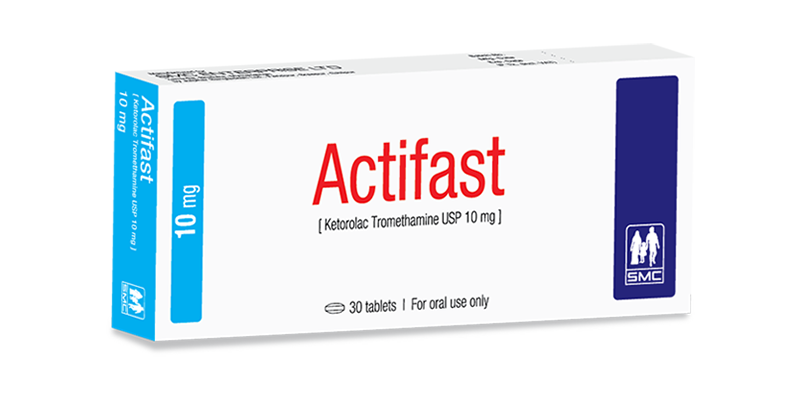 Actifast tablet: Each film coated tablet contains Ketorolac Tromethamine USP 10 mg.
Ketorolac is a non-steroidal anti-inflammatory drug (NSAID). It inhibits synthesis of prostaglandins and may be considered as a peripherally acting analgesic. It is highly protein bound and is largely metabolized in liver. The products of metabolism and some unchanged drugs are excreted in the urine. Ketorolac is very effective for the short-term management of moderate to severe pain. Adults and Children (over 16 years): 10 mg every 4-6 hours as required. Maximum daily dose is 40 mg, maximum duration of treatment is 7 days. Side effects of Ketorolac are anorexia, nausea, diarrhoea, abdominal pain, dyspepsia, headache, dizziness, restlessness, drowsiness, insomnia, dry mouth, acute renal failure, bradycardia, asthma etc. Lactation: Contraindicated to nursing mother. Pediatric use: Not indicated for use in pediatric patients. Ketorolac is contraindicated in patients with known hypersensitivity to NSAIDs and any of the components of Ketorolac. Moreover, this drug is contraindicated in patients with history of asthma, nasal polyp, angioedema, peptic ulcer and bleeding disorders. Precaution should be taken in elderly, allergic disorder, renal, cardiac and hepatic impaired patient with low body weight. Increased risk of haemorrhage when Ketorolac is given with anticoagulants and NSAIDs. Actifast tablet: Each box contains 3 x 10’s tablet in blister pack.